Getting your students to understand theme can be difficult. However, don’t give up. You can get your students identify the theme in text. You can get your students to identify the difference between a theme and a topic. 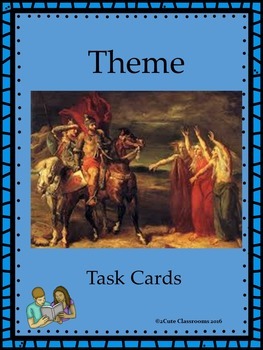 The following are 10 task cards that ask your students to identify theme. 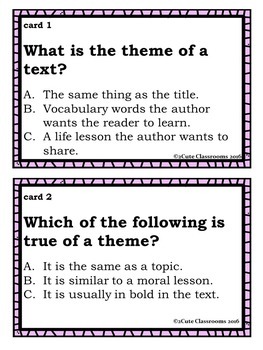 The first 6 cards give students practice on recognizing the theme. The last 4 cards provide students with a brief excerpt. Then, they ask the students to determine the theme. 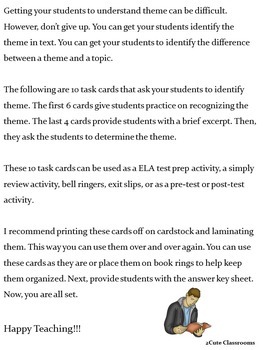 These 10 task cards can be used as a ELA test prep activity, a simply review activity, bell ringers, exit slips, or as a pre-test or post-test activity. I recommend printing these cards off on cardstock and laminating them. This way you can use them over and over again. You can use these cards as they are or place them on book rings to help keep them organized. Next, provide students with the answer key sheet. Now, you are all set.